Natural. Green. Organic. These words are changing the beauty industry. Consumers have become more aware of the chemicals and ingredients found in everyday items, and brands have been forced to take note. The result is a rise in mineral makeup. Though they do not contain many of the harmful ingredients in traditional products, it is still possible to have an allergic reaction. One of the most common signs of an allergy is a breakout. Shortly after using a product, a pimple or two may appear on the skin, or it could be a more significant flare-up of acne. Any breakouts and blemishes indicate the skin is having an adverse reaction to the makeup. This is often the result of mineral products that contain bismuth oxychloride. According to WebMD, it has been found to cause acne flare-ups on people with highly sensitive skin. In some cases, users may experience red skin that looks and feels inflamed. Though the symptoms may be minimal and temporary, they can also be more severe. An article on allergies to Bare Escentuals found that some people have reported red or raw-looking skin as well, as swelling, caused by this mineral makeup brand. This is due to a combination of harsh ingredients like bismuth oxychloride, zinc oxide, and mica. If this type of reaction does not improve within a day or so, contact a dermatologist. It may require a steroid cream to reduce swelling or a calming gel to combat redness. It is also possible to experience skin that feels itchy and generally uncomfortable. If mineral makeup makes your face itch, there are a couple of possible explanations. The first is a sensitivity to Titanium Dioxide. This can create a feeling of itching or discomfort whenever you sweat. It may also have to do with your application technique, as buffing mineral products aggressively can lead to flakes, itchiness, and dryness. Another common reaction to mineral makeup is dry, flaky, or patchy-looking skin. It can be difficult to wear some mineral-based products if you have naturally dry skin. However, there is a difference between a product accentuating existing dryness and making the problem worse. Certain ingredients like silica and kaolin can dehydrate the skin, making it appear older, highlighting imperfections, and causing tightness. Scientists at The Beauty Brains suggest that ingredients like topical silica can worsen dry skin. When it comes to mineral makeup, there are many products to choose from. Some are for the face and others are designed for use on the eyes. Anyone with eye allergies knows that finding gentle makeup for this sensitive area is essential. Unfortunately, many brands include bismuth oxychloride and mica in their formulas. An eyelid rash (which is red, itchy, dry, or scaly) is often the result of these ingredients coming in contact with the skin. It is more likely to appear on those with a history of issues like rosacea, eczema, and dermatitis. Bismuth Oxychloride. Bismuth Oxychloride is by far the most common reason for an allergic reaction to mineral makeup. It is typically used to add shine or a dewy finish to a product (which is desirable since some mineral-based products can be drying). The downside of this additive is that it is very heavy. This may lead to clogged pores, irritated skin, itching, red bumps, and many other unwanted reactions. If you find that you are allergic to mineral makeup, bismuth oxychloride is the most likely culprit. Mica. Another problematic ingredient is mica. This is a little more complex as not everyone will have a reaction to small doses. According to an article on mica allergies, it is an inert ingredient, which means it is not chemically reactive and rarely causes an allergic reaction. The reason so many people experience redness and inflammation from it is due to chemical coatings. Different chemicals are used to help improve staying power, finish, and texture - and this is what leads to allergies. To prevent a problem, make sure mica is low down on the ingredient list or not included at all. Zinc Oxide and Titanium Dioxide. Two ingredients that are often used in mineral makeup are zinc oxide (which provides moisture resistance) and titanium dioxide (a colorant which makes colors appear bolder). Both also provide sun protection, keeping the skin safe from harmful UVA and UVB rays. A built-in sunscreen can be a major selling point when it comes to a mineral makeup product, but both can cause a reaction in some people. A Skins Matter article on titanium sensitivity found that even though metals are not allergens, their ions "can bind to biological protein molecules and convert them into proteins which have greater allergic potential." Carmine. If you have experienced an allergic reaction to mineral-based products, it may be the result of carmine. Though this is considered harmless to most, it can be an irritant for people with sensitive skin. It uses the crushed shells of insects like the cochineal beetle to add vibrancy to colors and increase how long the makeup lasts. Usually used in eyeshadows and lipsticks, this is often put in place of synthetic red, purple, and pink dyes. Carmine in cosmetics can lead to allergic reactions such as itching, watery eyes, swollen eyelids, and in severe cases, anaphylaxis according to the University of Michigan. Boron Nitride. Since bismuth oxychloride causes problems for some people it only makes sense that there is an alternative ingredient. That is boron nitride, which is used to absorb oil and provide a healthy-looking sheen. According to a Green Beauty Team article, however, this additive can severely dehydrate the skin and make existing dryness worse. As a result, it made their list of seven ingredients that shouldn't be in mineral makeup. Read product labels carefully. This is by far the most effective way to avoid an allergic reaction. 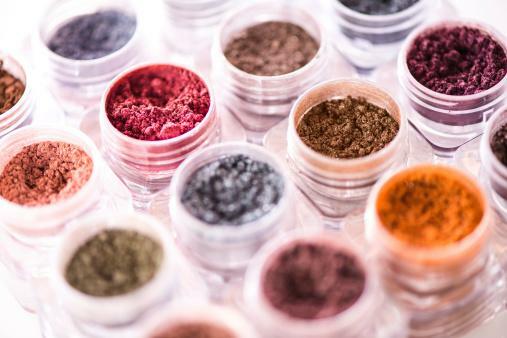 Before you buy any mineral makeup, make sure none of the aforementioned ingredients are included. If they are, look into a different brand. In some instances, the ingredients may not be written on the product itself or its packaging. Perform a quick search online, check out the company website, or phone the brand's customer service number for more information. Choose items with small ingredient lists. Most products have a fairly lengthy list of ingredients. If you are looking for natural makeup that is unlikely to irritate, avoid anything with a lot of different additives. A non-irritating mineral makeup will contain between three to eight ingredients. The smaller the list, the better. Ideally, you should be able to recognize most of the items and there should not be any preservatives, synthetic dyes, or chemicals. Look at online reviews. These days it is easier than ever to find out information. One of the fastest ways to determine whether a product will cause an allergic reaction is to look online at reviews. There are plenty of websites that host reviews from beauty lovers and people with specific skin conditions. Browse through some of them and see if anyone else has reported an allergy. If they have, look into the product further or try out a sample before purchasing. Don't delay proper treatment. Sometimes, no matter how careful you are, a reaction will occur. If that happens, make sure you take good care of your skin. Stop using the product immediately and give the skin time to breathe and heal. Using something like a soothing aloe vera gel can speed up healing. If after a day or two, no changes have occurred, it may be time to visit a professional. Talk to a dermatologist about the necessary treatment options for your specific reaction. Omiana is a brand that is all about natural pure ingredients. Their products are made without chemicals (there are options for makeup that is free from mica, titanium dioxide, carmine, chemical SPF, and more) and their website even allows you to shop by ingredients you want to avoid. This is a straightforward and simple way to get the look you want without worrying about unwanted allergies. Haut Cosmetics is another option for those looking for products without mica and other allergens. All of their items are certified organic - as well as cruelty-free and vegan. With a wide range of mineral makeup products, including pigments, lip butters, and cream tints, there is enough variety to create an endless array of looks. Rejuva Minerals also offers mineral makeup products that are free from common skin irritants like mica as well as parabens and nanoparticles. Their products are certified organic and include both loose and pressed powders, along with lip glosses, lipsticks, and even mascara. If you are concerned about allergens and unnatural ingredients, this is a brand to consider. There are many reasons beauty lovers are turning to minerals. According to a Marie Claire article on mineral makeup brands, it works well on sensitive skin, is non-comodegenic (meaning it does not clog pores), and absorbs excess oil. It is also considered to be more natural and is often praised for containing organic cosmetic ingredients. This is important as organic personal care products make up a market expected to reach $15.6 billion by the year 2020. 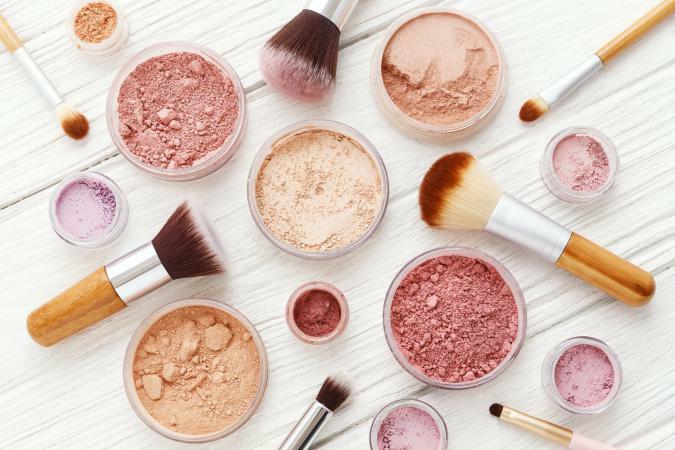 Mineral makeup is defined by the ingredients that are left out, such as: preservatives, parabens, dyes, and fragrances. These often cause an allergic reaction and can worsen the appearance of skin issues like rosacea and eczema. Though powder formulas are more commonly associated with mineral products, liquids and creams exist as well. This makes it suitable for dry, normal, oily, and combination skin types. Despite the positives with this type of makeup, it is still possible to have an allergic reaction. Fortunately, you can arm yourself with information like the list of possible allergens above to help prevent one, and know what might happen if a reaction occurs. Not all mineral makeup is created equally. In fact, some are loaded with harsh and harmful ingredients. In order to avoid allergic reactions, it is important to read the labels and do your research. By putting extra thought into your next purchase, you can prevent unwanted symptoms from appearing. Non-Comedogenic Makeup By Laura Williams, M.S.Ed.